It is still a bit rainy outside, one of those days that you feel like craving for something different to eat. You are getting tired of take out dinner. You probably tired of eating meat or fried foods. 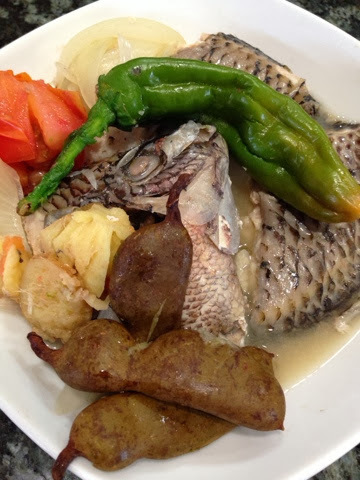 Then maybe, I can help by sharing this sour and tangy goodness of tilapia fish. The ingredients likely will be in your kitchen or fridge except for the tilapia. Pinangat has different meaning depending on what region you are in the Philippines. In Bulacan it means, stewing the fish and adding something to have a sour taste to it like kamias, tamarind or calamansi juice. It is not the pinangat version of Bicol region which is cooking with taro leaves and coconut milk. And as I have said before, this recipe is super easy to follow. I took pictures while cooking this dish to guide everyone who wants to try this dish. If you do not have fresh tamarind you can always use tamarind soup base mix available in most Asian stores. Add water just enough to immerse the fish. Simmer till it is boiling, then add salt to taste. Turn off heat when fish is cooked. Transfer to plate, serve with rice. Enjoy!